Since yoga training we’ve been on the go. A whole month plus has passed since then, I can’t believe it. Since leaving Mysore we’ve explored Bangalore, Hampi, Goa, Ellora and Ajanta Caves, Sanchi Stupa, spent time with our pal Deepika and her family in New Delhi, the Sikh Golden Temple (as well as the Pakistan/India border for grandiose displays of nationalistic military muscle flexing), Chandigarh and finally to McLeod Ganj. Settling into the foothills of the Himalayas, in the home of H.H. Dalai Lama and the Tibetan community in exile, resting here until our Tushita Buddhism retreat later in May. When traveling long-term like this you balance moving quickly through tourist areas to slowing down and simply enjoying one place. You have to. Otherwise its an exhausting, uninhabitable state - you question what the hell you’re doing, what’s the purpose of all this fast moving? What can be learned in this frantic state? Overnight buses are like time traveling portals. Because India is so vastly diverse from state to state, getting on a bus after dark late at night and waking up in a new place - often arriving early when the weather is still cool and the world is still waking up - you see subtle or sometimes drastic changes in the people, environment and raison d’être in each new place. Arriving in Amritsar from Delhi for instance, was one of those drastic changes. 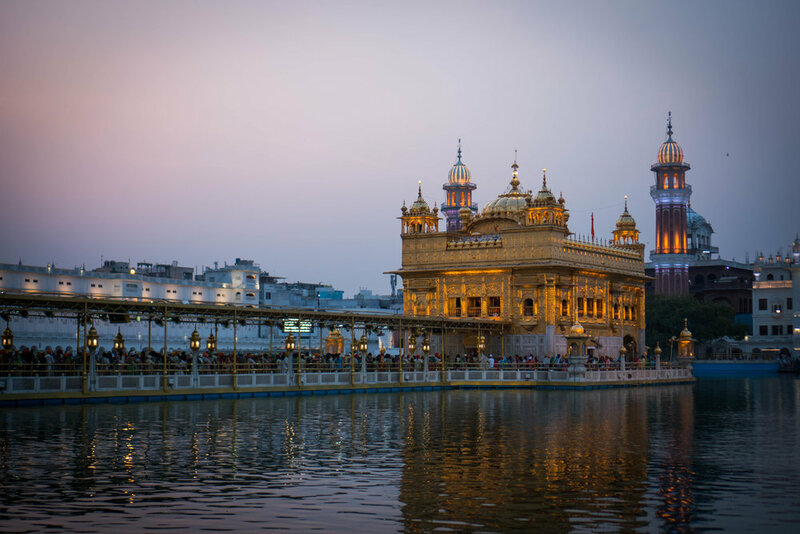 Amritsar is a western city of the stare of Punjab, a 45 minute auto ride from the Pakistani border - and is home of the famous Sikh guduwara (temple) known as the Golden Temple. It’s the only city I’ve been to in India with a walking plaza, no cars or motorcycles allowed, old cobblestone streets kept immaculate by nocturnal street cleaners. Arriving in our first Punjabi city proved to be one of the most drastic shifts in feel from any city we’d visited thus far. For the first time we were in a place that wasn’t predominately Hindu. Punjab is the only state with a majority Sikh population in India (57% Sikh vs. 38% Hindu). In my experience, the Sikhs have some of the most welcoming energy of any collective people I’ve encountered. If you don’t know much about the Sikh religion, its a beautiful approach to life. The world’s youngest religion, its based on equality for all (no caste system), with an emphasis on respecting all living beings and working together to benefit all humankind. They embody this idea strongly by offering free meals, accommodations and showers to all people in their guduwaras, no questions asked. At the Golden Temple you see this commitment expressed tenfold as they serve more than 50,000 free meals everyday at their Langar (community kitchen). Endless chapatis, dal, mixed vegetables, filtered water, chai and a sweet dish served democratically, all people sitting in a line as a symbol of equality. Its an effort coordinated by thousands of volunteers. You see groups of people cutting vegetables, rolling out chapatis, cooking great vats of dal and chai, serving food, doing dishes, directing traffic - it functions like one great compassion organism. Every person playing a small part to contribute to a simple end goal. The guduwara is an incredible complex and exudes an openness that I’ve never experienced at any other place of worship. Entry is free, storing your shoes is free. The complex is basically a rectangle of marble buildings and on the inside is a huge courtyard with the lake of nectar for holy dips. The illustrious golden temple, shining in luminous gold sits in the middle of the lake. No matter what time you visit, whether is 3PM or 3AM, the guduwara is bustling. Sikhs don’t really have a concept of a guru or priest, the emphasis is on the wisdom that comes from their religious text called the Guru Granth Sahib. Meditation on the text or singing kirtans is the most common way to engage with the teachings. I was told that say if a baby is born in your family or you wish for a blessing of some kind, they will send a reader to read the entire text over three days straight, swapping out readers every few hours. “Sikh” comes from the Sanskrit word for student - and every time I’ve tried to inquire about who does one go to if you have a questions about the teachings, thinking there must be some sort of religious leader or hierarchal structure like any other religion, but it doesn’t function it the same way. Sikhs emphasize equality in all aspects. Everyone is student. Everyone is on the path. They don’t have monk-like devotees either, as they believe oneness can be achieved through a worldly life - having a family, practicing values of generosity and compassion in everyday life. This is just a small taste of what makes the Sikh way of life fascinating and something we can all learn from. Their history is full of persecution and perseverance, in an effort to preserve their culture despite external attempts to dissolve it. I feel extremely grateful to have had a chance to sit inside the walls of the Golden Temple, sitting in the shade of the marble awnings watching as people from all walks of life circumvent the lake of holy nectar - in awe of the inclusive space created. The Golden Temple Langar in Action.